WaterWipes, the world’s purest baby wipes, has launched #ThisIsParenthood in over eight countries. The project is in direct response to research that shows the ‘picture perfect’ portrayal of parenting in culture is disempowering parents, with over half of parents feeling like they are failing in their first year. With the majority of the category adding to this perfect image of parenting, the need for greater honesty in culture around parenthood inspired #ThisIsParenthood and aims to disrupt this unrealistic image of parenting by documenting the realities of parenting across the world. To create #ThisIsParenthood, WaterWipes has partnered with 86 parents across three continents to produce a 16-minute documentary, 12 short films and a photography series that shine a light on real parenting. 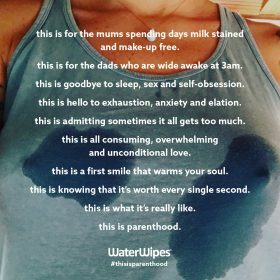 Through #ThisIsParenthood, WaterWipes wants to change the conversation around parenting by celebrating the realities, normalising the ups and downs, and bringing parents together through shared experiences. This new global study surveyed over 13,000 parents worldwide and revealed that more than half of parents (55 per cent) feel like they are failing within the first year of parenthood and that the ‘picture perfect’ portrayal of parenting in our culture is disempowering parents across the world. Of the 1,000 Australian and New Zealand parents surveyed, almost two thirds (63 per cent) felt like they were failing during their first year of parenthood – with mums more likely to feel this way than dads (67 per cent vs 48 per cent). According to the WaterWipes study, the top sources of pressure for new parents in Australia and New Zealand are social media, other parents, advertisements, the portrayal of parenting on TV, their partner, and pressure on themselves. More than half of these parents (51 per cent) feel that the highest contributing factor to feeling as though they are failing as a parent is when they fail to meet the high expectations they set for themselves. The fully integrated platform of #ThisIsParenthood was created in collaboration with BAFTA-nominated director Lucy Cohen and shot over two months across three continents. Cohen said: “As a new parent, this project really resonated with me. “It can feel as though there are a whole host of expectations from the outside world as well as the pressure a new parent inevitably puts on themselves to get it right first time. “It was a privilege to work with such inspiring parents across the world and I am grateful to all of those who willingly shared their reality. Using the documented footage, WaterWipes developed an ecosystem of content specifically designed around their audience and the unique consumption habits of parents. The agency identified specific tensions and social taboos to create short films around themes such as bonding, identity, and good old-fashioned mess. The content was designed to live, breathe and grow on social channels, where it can inspire and empower parents to share and discuss their #ThisIsParenthood moments – fuelling a global shift towards a more honest and open conversation around the highs and lows of parenting. Marzena BodyCare Australasia (AUNZ distributors of WaterWipes) marketing and sales manager, Andrea Hawes said: “As a brand competing in a category dominated by big players, we were looking for a disruptive approach that would challenge stereotypes. “At times parents are left feeling like they are failing, especially when they are surrounded by false images of perfect parenting, and as a company that stands for integrity in our products, our advertising and everything we do – we wanted to change this.